Indian election is the major buzz now. Promises for economic growth, anti-corruption country have been made. Statements and counter statements on the online world is too loud too ignore now. However, while everybody is speculating, it is still hard to grab the signal mangled with noise. If you are an Indian and feel deeply about your voting rights, you should be in the know of what’s happening around, it’s time, many Indian IT majors and Online Companies have come to your aid. Here are a few most talked about features and apps that will help you be a responsible and informed voter. 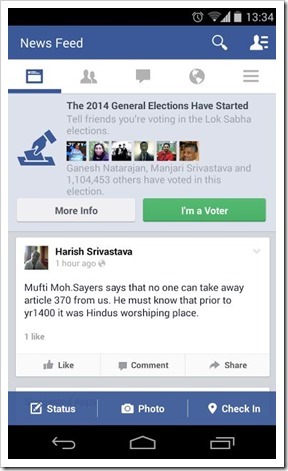 Facebook’s I’m a Voter is intended to allow users share their voter status on the poll day. Based on location and age(above 18) , the feature will show up on the app, which will let them update their status which will have a update as “is voting in 2014 Lok Sabha Elections”. This feature can be considered as a follow up for the Registered to Vote update launched in 2013. Google’s venture even more meaningful in the context of the polls. In an era where, people are very much disconnected (read frustrated) from politics, the Know Your Candidate is a nice way to have a quick look at the candidates of your constituency before you cast your vote. In the Google Maps mashup, you can enter the pincode (or just click on the area on map) for your locality and the app will show you the candidates from different political parties that are contesting for the constituency you reside. In the cards on the left, you will find links to more detailed info about the candidate. The information will be available only a week before the actual poll dates. Additionally. Google Hangout has played a key role to get the leaders like Narendra Modi, Arvind Kejriwal etc address their voters’ queries. This is certainly something you want to keep an eye on, if you are very keen on the interest analysis about the Indian election, this will come truly handy. Social media being a key promotion platform this election to reach out to the Indian youth, there is a lot of chatter happening on the most popular social network. 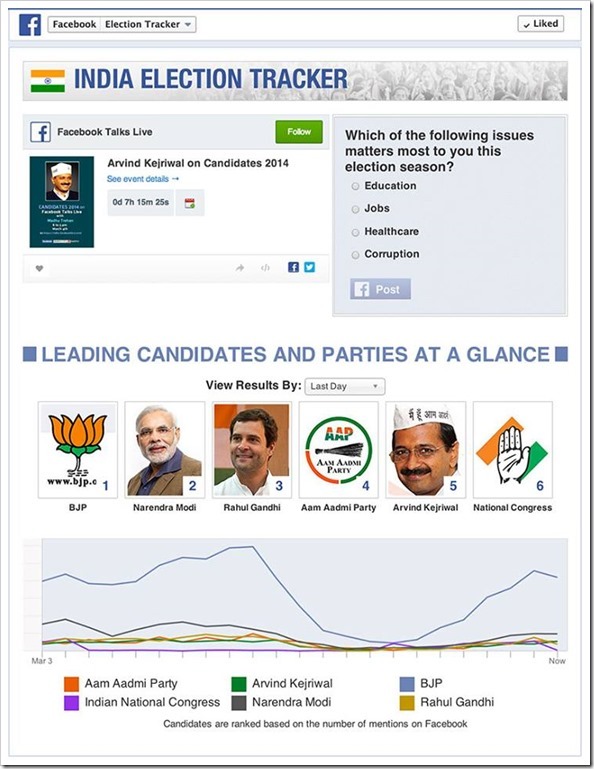 India Election Tracker is a nice way to keep a tab on the candidates and political parties who are mostly mentioned on Facebook. Apart from the above mentioned app and button, Facebook also have a page on the interest list for the Indian political scenario. Are you more into the news? Here is a wonderful Youtube channel that compiles interesting videos from different sources. In an effort to encourage users to vote, Uber has decided to offer two free rides upto Rs 1000 on the election day. The offer is valid for new and returning customers staying in Delhi, Mumbai, Bangalore, Chennai and Hyderabad. All you need to do is use the special promo code. The neat and insightful Android app by the Indian IT major is indeed a great way to keep on top of the election fever. 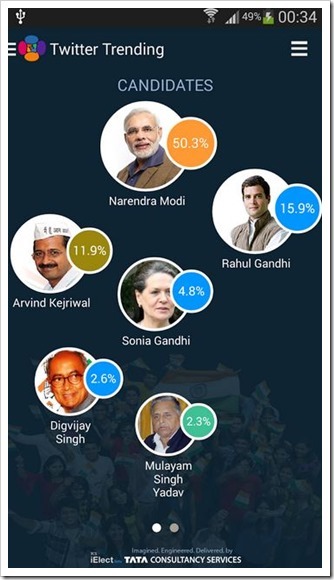 It is based on trending tweets and lots more like voter tone voice for a candidate election manifesto, sentiment trend comparison, digital activity trend and many more. It will still take a long wait to know who emerges the winner to take the top seat in the administrative architecture. In the meantime you can take a front seat as the million dollar story gradually unfolds.